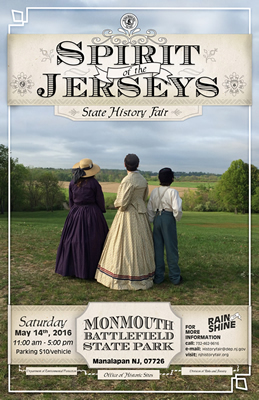 “Emily Roebling” will join Clara Barton, George Washington and Walt Whitman Saturday, May 14th at the 12th annual SPIRIT of the JERSEYS State History Fair at Monmouth Battlefield State Park, Manalapan, NJ. Come for historical reinactmentsas well as such as 19th baseball, horse-drawn plowing demonstrations, Phydeaux’s flying flea circus and period music. This year there will be several Civil War themed programs to coincide with the exhibit of President Lincoln’s casket. This replica casket will be on display in the park’s Visitor Center. A local Civil War reenactment unit, the 14th NJ Volunteers, Co. H, will provide an honor guard for the casket and the Fort Delaware Cornet Band will perform music of the era on period instruments. Darrel Ford, portraying Walt Whitman, will read his poem, “Oh Captain, My Captain”, a tribute to President Lincoln. Kenneth Serfass , who will portray General Ulysses S. Grant, will reflect on his relationship and career with the late Commander in Chief. There will also be a fictional U.S. Army radio and live show, “SPAM Time”, which is modeled on actual entertainment presented to U.S. military personnel from WWII to the Viet Nam War era. A full day of pre-recorded and live musical entertainment will be presented. This entry was posted in Uncategorized by cslevin59. Bookmark the permalink.